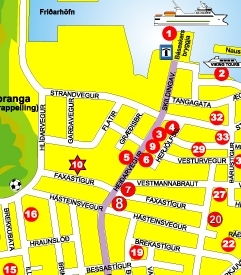 Our guesthouses are centrally located in Vestmannaeyjabær on Heimaey. From here there's only a short walk to everything the Westman Islands have to offer. There are only a few steps to the town center, where you can find shops, banks, restaurants and museums and after about a ten minutes walk you can relax in the hot tubs of the Westman Islands salt-water swimming pool. If you decide to walk a little further you can even practice your golf swing at the 18 hole golf course in Herjólfsdalur. We offer single rooms, double rooms and family rooms that can accomodate 3-4 persons. 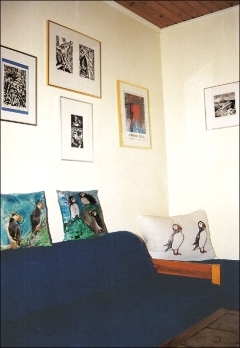 Our rooms are divided between two guesthouses, Hreiðrið and Hrafnabjörg, that share the same garden. Both houses have kitchen facilites, a breakfast room and a television room. Hreiðrið has one shared bathroom with a shower while Hrafnabjörg has two toilets and one big bathroom with a bathtub. Alltogether we have 23 beds and we can accomodate large groups of up to 50 persons in cooperation with another guesthouse near by. As previously noted, our guesthouses share a large garden. In the garden is a grillhouse and a patio with benches and tables ideal for barbeques. The garden, along with all of its facilities, is available to our guests. Access to a washing machine and an internet connection is available upon request. We can arrange sightseeing tours around the island by bus or boat, hiking tours for small or big groups with a guide and we also give out information about hiking trails and interesting places. Ordering can be done using this online form, through e-mail or phone. Breakfast is available on request for 1600 kr per person.